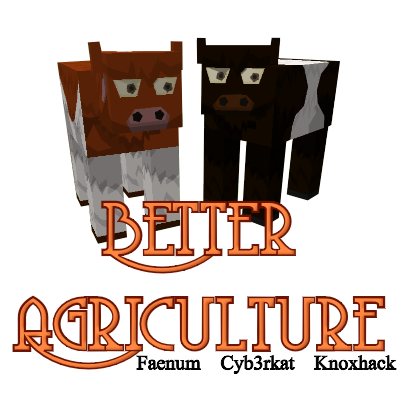 Better Agriculture is a minecraft mod that currently adds 40 new breeds of farm animals (with more to come) plus lots of deco blocks and items that will enhance your farming experience, to help you build your dream farm. Wait… so are the new mobs gendered? If theres duck stuff and goat stuff, why do you not add ducks and goats. New animals: Turkeys and Geese. that's the other issue, getting copyright free sounds. but we are working on it though, the mod isnt the only thing the team is working on so its takes time. as long as all your doing is linking people to this page, then thats fine. re-uploading the mod files to another site however is not allowed. Does anyone know what the Farmland biome id is? I have Biomes O' Plenty and can't find the biome for this mod? I wish to play this mod, but it work with hungry animals? Will be nice if work. Nice mod but confusing name. Should really be called Better Husbandry. The mod is still a wip, there is a lot of blocks and items still to add and new species to include. Husbandry is the care of animals, this mod adds new features to enhance all aspects of pastoral farming. There are already plenty of mods that add arable farming so theres little point in repeating that. Are most of the items not added to 1.12.2 yet or just not showing up in jei? Theyre not added yet, there was some issues with some of them. They will be back though, dont worry. lost of them were added back in version 1.2.2 that got released a couple of days ago. There are still more to come though, lots of content still to add. Why is this categorized as an addon for Forestry? I don't see how this can be such a thing. Its not an add on in the sense that you need forestry installed, its more that its a companion to it where having BA, harvestcraft and forestry together completes the experience. is this compatible with moo fluids and other mods that add new animals to the world natural spawn?